One of the weird things that happens when you go vegan is that you often find yourself having conversations about bodily functions. So, it wasn’t too strange that my vegan friend and I started talking about how our B12 supplements make us have to pee constantly. My friend was also having a crazy appetite from her new pills. This is also a pretty normal side effect, but it usually normalizes after a few weeks. Her appetite was still going strong, so I asked her what B12 dosage she was taking. She didn’t know. I asked her what type of B12 she was taking. Again, she didn’t know. Vegans, I love you, but please so some research before you start putting pills blindly into your body! With B12 dosage, you don’t have to worry about overdose because B12 is water soluble (you will just pee it out). But taking too much can leave you with some weird side effects (like these B vitamin side effects). You’ll also have some pretty expensive pee! How Much B12 Should You Take? The RDA for B12 is 2.4 mcg daily for healthy adults. You might be surprised to hear that this RDA is based on a study from 1958 which included just 7 people. Needless to say, there have been a few more studies on B12 dosage since then. Based on these studies, some experts are pushing to increase the B12 RDA to 4-7 mcg daily. Interestingly, the RDA for B12 in the UK is 1.5 mcg and only 1 mcg in the EU. It just goes to show you how much medical recommendations can vary. Let’s say you want to play it safe and strive for the newer B12 RDA of at least 4 mcg daily. So, you could logically assume that you need to take 4 mcg of B12 daily and you’re good. But why then do all B12 supplements have such higher dosage amounts, like the Deva Vegan B12 which has 1000 mcg per tablet? It is because our bodies are not capable of absorbing all 4 mcg at once. Doctor Greger (who himself follows a plant-based diet) explains this very well in this video. He says that our B12 receptors become saturated at about 1.5 to 2 mcg. Your receptors can’t absorb more than this at once. But (this is important) about 1% of the remaining B12 goes into our bloodstream. Based on this math, Dr. Greger recommends taking one 2500 mcg of B12 in the form of cyanocobalamin weekly. Wait a second. 2500 mcg weekly? I thought the RDAs were set for daily intake. Dr. Greger explains that our bodies are very good at storing B12 (it is stored in the liver). So, you can skip the daily supplement and just take one weekly instead. This is backed by other vegan nutrition experts, like Jack Norris. However, they do generally advise a daily supplement. If you want to ensure optimal absorption, a daily B12 supplement probably is the best route. Taking smaller daily dosages instead of one big weekly dosage might also help you reduce those annoying side effects like having to pee constantly or increased appetite. For daily supplementation, Dr. Greger recommends 250 mcg daily. The math is a bit weird, but that is because of how our receptors absorb B12. *Note that this recommendation is based on the cyanocobalamin form of B12! You’ll note that Dr. Greger’s B12 dosage is based on the cyanocobalamin form of B12. The methylcobalamin form of B12 is not nearly as well absorbed and assimilated in the body. Thus, the recommended B12 dosage for methylcobalamin is much higher. Jack Norris puts it at 1000 to 2000 mcg per day. Dr Greger, going by the increased B12 RDA, says to strive for 2000 mcg of methylcobalamin B12 daily. There are 3 main variables which will affect your B12 dosage: which RDA you want to go by, the form of B12 you are taking, and how often you are taking it. You can see Norris and Messina’s B12 dosage recommendations for other age groups here. *If you experience side effects from B12 which don’t go away, like having to pee constantly or increased appetite, you might want to try spacing your dosage throughout the day. If the B12 supplelment has a score line on it, you can even cut it in half. Take half with breakfast and half with lunch or dinner (if nighttime peeing isn’t a problem). If you are taking a B Complex supplement, you might be getting too much B2, which can cause some whacky side effects like vivid dreams. 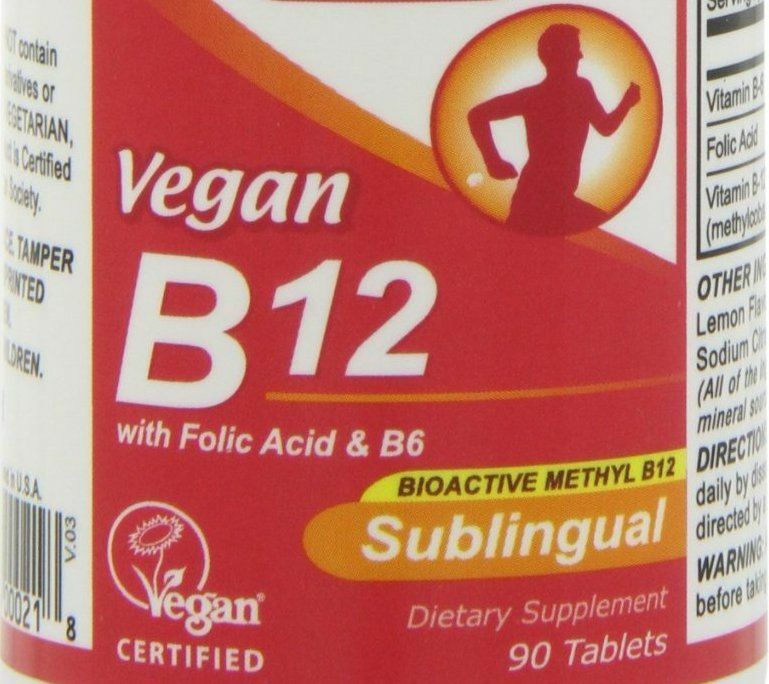 Unless you think you need all your Bs, you might want to switch to a B12-only formula. Always take your B vitamins with food!!! The consensus from experts like Dr. Gregor and Jack Norris is that chewable, liquid, or sublingual supplement is the best way to get B12 . By taking these forms instead of your standard pill, you are more likely to absorb the vitamin. Vitamin B12 is actually absorbed pretty early in the digestive track, so you can skip those expensive time-released B12 supplements. Time-release pills have their place, like when you need a steady dosage of medication throughout the day. But, for B12 at least, time-released formulas are NOT the best choice. Think about it: our bodies weren’t meant to get a constant influx of vitamins and minerals. Our bodies get nutrients at meal times. In some cases, time-released supplements can even be dangerous. For example, time-released niacin can damage the liver. Time release vitamins are coated with shellac to slow dissolution (the dissolving process). This is fine if the vitamin is absorbed throughout the entire intestinal system, but most vitamins are not. They are absorbed early in your intestinal system. And, because of this, the coatings will prevent you from getting benefits of the vitamin. Sometimes, we even see undissolved, time-released vitamins on X-rays. The best multivitamins are not the one-a-day, or time-release type. They are the 3 to 6 a day kind, taken in divided doses, to keep vitamin levels in your blood consistent, assuring your cells have what they need all day long to be their best. Time-release supplements are usually more expensive (and probably not vegan either). Since they don’t offer any benefits, you shouldn’t waste your money on them. The one exception to this might be if you get side effects right after taking your supplement. The slow release can be easier on your stomach. But you’ll probably still be better off taking smaller dosages throughout the day instead. If your supplement has a score line, you can cut it in half and take it in two dosages instead of one. By the way, I am not a doctor so don’t take any of this as personal medical advice. I speak from my own experience and research only!